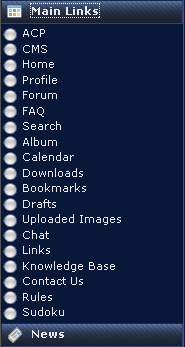 Old Support Topics :: How To Make Minimized Menus By Default. How To Make Minimized Menus By Default. Would it be possible to make menus such as the one below be minimized by default? To clarify, navigation menus contract when you click their header. Can I make it so that menus are contracted by default and then expand when clicked? Re: How To Make Minimized Menus By Default. There are couple ways but the easiest one is Dyn Menu and you can pick / control it thru CMS. I don't see any option to control minimizing of the dynamic menu in the cms section. goto CMS Control Panel >>Global Block>>add new Block in left side then click on option "Show/Hide Switch"
That feature does what is already accomplished by clicking the menu's header. It does not affect the default behavior. If you have any other suggestions let me know. My default menus currently look like this picture on my website. I would like to make the default appear like this (minimized). When I did that all I was offered was a +/- option in the header to minimize the menu. When I clicked it, it had no impact on minimizing/maximizing the menu. Additionally, I tried ctrl+f5 to make sure and the result was the same. I tried that as well. It's not a cache issue. Help around here is getting conspicuous by its absence. Clear cache's - Pray MG fixes it for the future. Before I go ahead and do this, will this work if I am using RC version 1.2.24.51? Re: How To Make Minimised Menus By Default. By the way, there IS a difference between the .tpl menu that you are obviously trying to change and a "Dynamic Menu" which you have to create and switch on, and of which is all covered in the Docs Threads. There is also no support for "Modifying" RC releases. If you think it's a bug because you can't get the Menu to do what you expect it to do - Then post it as a BUG!